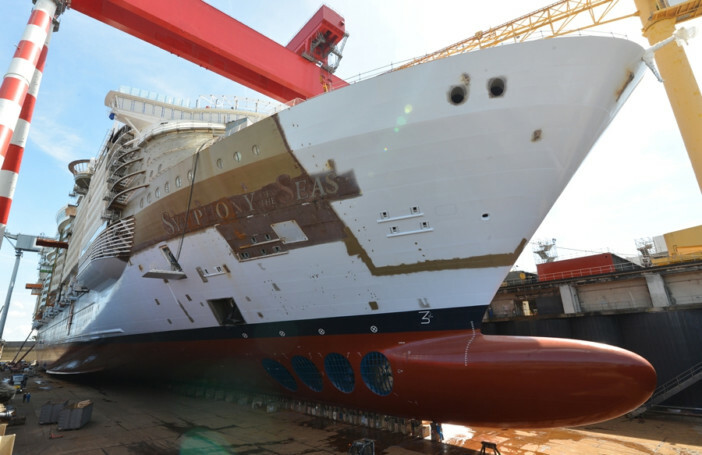 The latest ship in Royal Caribbean’s record-breaking Oasis Class has been floated out of dry dock for the first time after a year-long dry-land construction process. Symphony of the Seas will set new standards for cruise ships, weighing in at 230,000 tonnes, a massive 3,000 tonnes bigger than any other cruise ship on the high seas. Not only will this flagship cruise vessel offer even more room for guests than any of its predecessors, it will also have a variety of unique features. Due to be delivered in April 2018, the new ship will spend its inaugural summer season sailing around Europe, before arriving in Port Miami’s state-of-the-art cruise terminal. Symphony of the Seas is set to be a highly innovative ship, packed full of exciting on-board activities, dining choices, and entertainment. Whether you choose to brave the slope of the Ultimate Abyss, a soaring waterslide that plunges down a 10-storey drop, or to relax and unwind in the luxurious Vitality Spa, a cruise on Symphony of the Seas is guaranteed to be an extraordinary experience. As well as featuring many of Royal Caribbean’s returning favourites, the new ship will also have a variety of unique innovations that are yet to be revealed. Construction of the ship hit a new milestone this month, as it took to the water for the first time. 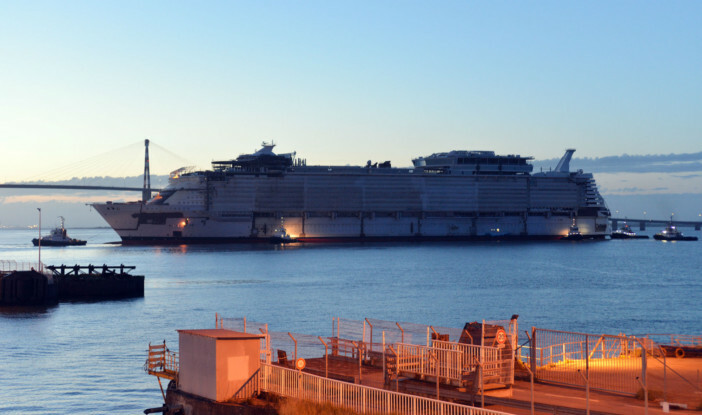 Floating Symphony of the Seas out of the dry dock ran smoothly, with about 50 people on board during the manoeuvre. As the ship’s engines couldn’t be used during the move, the three pilots were assisted by eight tug boats to get the ship into position. To ensure perfect positioning, the port of Saint-Nazaire – where the ship is being built, provides a sophisticated GPS system that is able to calculate position down to a centimetre. Symphony of the Seas will remain in her new position until her delivery date in mid-April 2018. After its inaugural journey, Symphony of the Seas will set sail on 17 November 2018 for its first Caribbean cruise. Caribbean itineraries will continue until April 2019 and booking for both Caribbean and Mediterranean voyages are currently on sale. If you fancy getting first dibs on an amazing cruise holiday on Royal Caribbean’s world record breaking new ship, Symphony of the Seas, itineraries are now available to book. Cruise1st UK is delighted to be able to offer some amazing deals on Mediterranean and Caribbean itineraries, so why not book your place today? Browse the full collection online or call our sales team on 0808 274 6777. Royal Caribbean's upcoming ship, Symphony of the Seas, takes one step closer to entering service by touching down on water for the first time.